Great finish, valve stem is protected, They held up great, beating them on Rocky trails and Rocky mountain trails. Lug nuts did not loose up even after all they went through. 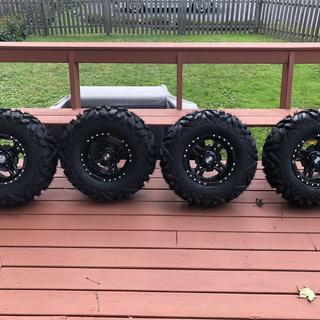 Really like the looks of the tires and wheels , have not tried it on the rzr yet but plan on it in a day or two. If tire and wheel assembly fits good will order 3 more. Dont understand why I couldn't get it mounted , only if I bought a set of 4. Could only afford 0ne tire and wheel assembly at a time. Tried to tell customer service at that time but still no luck. Cost me another 30 doallars to have mounted . Still happy with the product. No so much with service. All I could say is wow when they showed up. Great looking rims at a great price with no issues. I used the website’s wheel builder and got these with the TriloBite 8 ply tires. The trails I ride are very rocky but after 100 miles they still look great. I have the black matte ones. 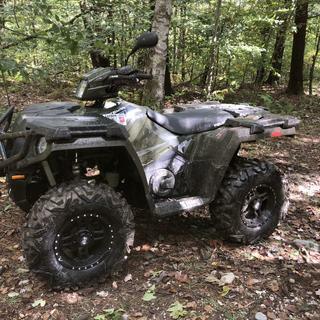 I plan on getting another set for my girlfriend’s atv soon. NOT IMPRESSED. SPECIAL LUG NUTS & SOCKET NEEDED BUT NOT INCLUDED!!!! The well where the lugs pop through is very deep. Deeper than my stock rims and standard lug nuts will not work (go figure they aren't included). They are also narrow, I cant find a 3/4" socket that will fit in the cavity. SUPER DISSATISFIED! Rugged, light weight, simple design making cleaning a breeze. These rims add a simple but rugged look to my machine. They are easy to clean and have ample room around the hubs and breaks so packing mud is less of an issue. The fit and finish is superb, well thought out design and quality of manufacturing is top notch. They have a "beadlock" semi look to them without the needed headache of beadlocks. Minimal weight and stylish looks sets off my Polaris ranger and really adds to the overall appearance of the machine. 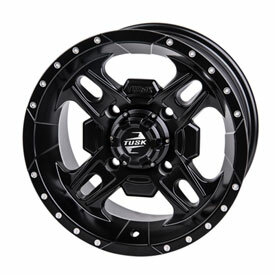 I put these on my 2017 Yamaha Kodiak 700- They look great and seem to be well made- For the money they are a great value- Love 'em. Fit my ATV perfectly. Had them out of the box and on in 2 hours! Customer service was spectacular and very helpful through 4 phone calls to assure fit was accurate and selection would deliver accurately. Wheel looks great it was bought as a spare and it really has me thinking about replacing all wheels with it. what do these measure from the mounting surface to the outside lip ( valve stem side ) on 14" 5+2? BEST ANSWER: That will be 2" out from the mounting surface. Is there a warranty on the tusk wheels? BEST ANSWER: We will stand behind all products we sell with regards to manufacturing defects in workmanship and material. No socket fits inside. Do I need really long lug nuts? I had to use a really thin-wall deep-well socket for the regular size nuts I ordered from here. I ordered the Tusk tapered lug nuts with the lug nut key. I did not use the stock lug nuts. Need tusk lugnuts,and matching tool to put on. I was told original lugnuts would fit also. We had to use an extender for the socket. 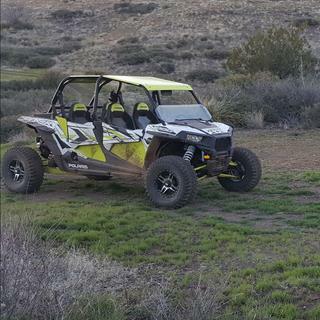 Can you use the stock Polaris RZR 1000 lug nuts with the Beartooth Wheel? I dont not believe so only because I also purchased wheel spacers and they utilized the stock lug nuts to fasten the spacer to the machine. Then the splined nuts were use to hold the rims on. I also ordered the spline tool. I believe somewhere in the fine print it may mention if you must use the spline nuts and tool. Yes, if they are tapered. Will the 4+3 offset make the machine wider than the 50in trail limit? BEST ANSWER: Will add 1 inch to each side of vehicle. You'll be a total of 2 inches wider than stock. Yes,but only 1 inch overall. Had no problems on the Paiute Trail in Utah. I'm deciding between this and the cascade wheel. How much does the 12" cascade wheel weigh? Will these work on my 98 300 Honda 4x4 ? 2/5 and 5/2 offset 4/110? BEST ANSWER: It looks like we only have the 12x7 with a 5+2 offset for this machine. I want to get new rim's on my 2016 razor 1000 s I'm not sure what off set to buy to maintain 60 inches? BEST ANSWER: 4+2 wheel offset for the Front, and 6+1 offset for the rear. 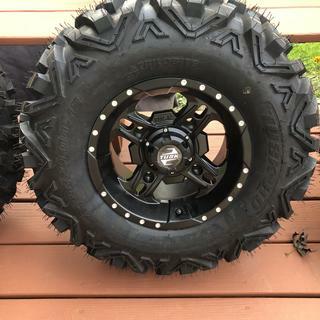 What is the best size rim to put on a rzrs to insure i maintain my stock 60 inches wide? BEST ANSWER: It really depends on your model and RZR. Usually a stock off set will be something like a 4+2 on the front wheel, and 6+2 on the rear wheel. If you want to stick with a stock offset you are going to want to choose aftermarket wheels that are fairly close to your stock offsets. Which lug nuts do I need for a 2018 Polaris Sportsman 570? BEST ANSWER: Any Tapered lug nut that is a 3/8" with a 14 mm head. I have attached a few options below. Are valve stems included with wheels? BEST ANSWER: Yes, the valve stems are included. Thank you. I'll do some more looking since I couldn't find them with my order. If you are missing them just give us a call and we can send you out some! 4+3 or 5+2...polaris the does it make a difference ? what is the weight of the 14x7 4+3? BEST ANSWER: These wheels in that size weigh approximately 18.5 lbs.